vArmour is extending its patented distributed security platform to protect workloads running on physical servers and legacy systems. This unique solution is an industry first and provides consistent policy enforcement across physical, virtual and cloud assets with its network based controls and an API driven ecosystem. Faraz Aladin is the Director of Marketing for vArmour. He has more than 25 years of industry experience with the last 20 at Cisco. His subject matter expertise spans across Switching, Routing, Wireless and Security. He is a CCIE and holds an engineering degree from Bombay University. The Analysts at Enterprise Strategy Group just wrapped up testing of the vArmour DSS Distributed Security System across physical, virtual, cloud, and container platforms and the results are in. With GDPR enforcement beginning May 2018 and fines of 4% of global revenue, it’s time for organizations inside and outside of the EU to build plans for compliance. How will GDPR's broad scope of requirements affect the personal information processed in your data center, and how can you simplify your path to compliance? In this webinar, we’ll give you the strategy you need to understand how personal data is flowing across your data center, and how you can implement segmentation to narrow your project scope and get you GDPR compliant faster. Enterprise IT is transforming rapidly and the evolution to container-structured applications is an important element of this transformation. From the container’s humble origins as a method to virtualize UNIX operating systems to provide process separation with high levels of efficiency, it has become the preferred method for building and deploying modern software into cloud environments. Containers are foundational to propelling agility in the enterprise - they are dynamic in nature, support increasing computing densities, have data residency and data provenance for governance and present challenges and opportunities for security in this new world with DevSecOps. Please join Peter Christy, Research Director of 451 Research and Marc Woolward, CTO at vArmour as they discuss all things containers along with a look at vArmour’s container strategy, solution and latest patent on container security. The digital economy is built upon distributed systems. Distributed systems scale horizontally, interconnect via APIs, and are highly resilient. The security solution for this digital economy needs to be equally distributed and capable of scaling out across the multicloud. The world has changed – the perimeter is disappearing alongside an explosion of internal threats. The imperative is to wrap security controls around assets so that environmental changes do not expose critical assets that need protection at all times. Security requirements have changed from the legacy appliance model to the modern distributed model. Intel x86 and virtualized platforms offer ubiquitous, fast, cost efficient solutions, allowing for deep packet processing at high speed and rapid deployment of new features in software. These platforms are unconstrained by the limitations of specialist hardware, ‘appliance thinking', and network technology posing as security products – Welcome to the new era of IT security, enabled by Intel and vArmour. Join PCI Qualified Security Assessor Coalfire and vArmour to learn how application-layer network visibility, software-based segmentation, and micro-segmentation can help organizations adhere to PCI DSS 3.2 requirements in data center and cloud environments. Eva Tsai will share her experience as a woman in tech charting a journey spanning multiple disciplines and excelling as a strategic business leader, her thoughts on the challenges women are facing, both in entering and advancing in their careers, and what her recommendations are on both professional and personal fronts. Eva has extensive experience leading go-to-market transformation and managing company telemetry to drive growth worldwide. Her innovation and leadership has been recognized with significant industry awards and patents. She was selected by Silicon Valley Business Journal in 2015 as one of Silicon Valley's 100 Most Influential Women and won the 2014 Marketer That Matters™ award, sponsored by The Wall Street Journal. At vArmour, Eva has transformed the company into a growth machine via innovative and well-executed go-to-market strategy, insightful telemetry, and process optimization. vArmour has been named a “Company to Watch” by TechCrunch and a "Cool Vendor" by Gartner. Prior to vArmour, Eva held strategic roles at Citrix, BroadVision and Oracle. Eva holds a BS and a MS in Computer Science from Massachusetts Institute of Technology. Legacy security architectures and traditional security platforms are ineffective at securing modern data centers. Modern data centers need a security solution that is software-based, distributed, and simple: making security better, faster, and cheaper. 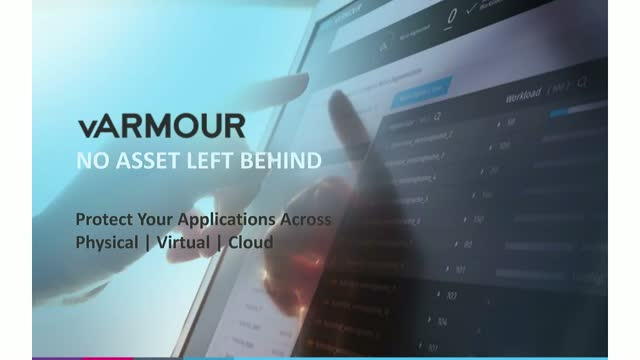 vArmour is the leader in software-based segmentation and micro-segmentation that protects critical applications and workloads in the data centers and cloud. Join this webinar to learn more about the simple steps to securing the modern data center with vArmour. The problem of detecting attackers in today’s enterprises and data centers is harder than ever. Well-funded adversaries with time and patience use techniques that blend in with enterprise activities, making accurate detection difficult. Security analytics promises to address this situation by throwing advanced math at available data sources in the enterprise, with the goal of finding the proverbial threat needle in the data haystack. This presentation will enable attendees to evaluate security analytic solutions, cutting through the buzzwords and hype, and providing both a deep understanding of the detection problem and a framework to evaluate solution efficacy, based on three axes: breadth, depth and control. As the global cyber threat environment continues to evolve, organizations need to begin thinking differently about information security and the protection of their infrastructure. The evolution from perimeter-centric, hardware-based environments to virtualized data centers and the cloud is underway and many organizations are late to the game. As CIO’s and CISO’s are driven to transition their CapEx investments to OpEx spending, the economic efficiencies of the cloud provide a rational path to those goals. From a security perspective however, security models that don’t sufficiently address workload and application-aware segmentation, lateral traffic visibility, and network-based threat detection of on-premises data center and public cloud-based environments leave a huge gap in the overall security posture. This talk will provide CIO's and CISO's struggling with decisions about migration to the cloud with some thoughts about how the cloud can be the catalyst that improves security while also reducing costs and technology footprint. Jon Oltsik, Senior Principal Analyst at Enterprise Strategy Group, and David Anderson, Director of Technology and Solutions Marketing at vArmour, analyze the results of a recent survey of 303 IT and security respondents. Jon and David will use the data to provide real-world recommendations for a proactive data center and cloud security strategy, including micro-segmentation, a burgeoning best practice to improve security posture and lower risk. Organizations are on a journey to transform their data centers into dynamic multi-clouds that demand a new security architecture. Hear from former technology fellow and CTO for networking at Goldman Sachs and vArmour CTO, Marc Woolward, as he outlines a vision and pathway to security in the multi-cloud world. Marc Woolward has over 30 years of experience in mission critical infrastructure and software-defined networks. Marc joined vArmour as CTO in February, 2015. Prior to this role he was a Technology Fellow and the CTO for Networking and Telecommunications at Goldman Sachs. He served as a member of the Technical Advisory Group and as the founder and leader of the Security Working Group within the Open Networking Foundation (ONF). Earlier in his career he managed infrastructure at Cantor Fitzgerald and Coutts & Co. Marc has a decade’s worth of experience architecting and implementing datacenter software automation, and private cloud architectures.